Because they absolutely love to run around outdoors and roll in the dirt, dogs tend to get their ears pretty dirty sometimes. Since they were bred to track a scent close to the ground, dragging their longer ears, hound type breeds are especially susceptible! Thankfully, a dog ear cleaner is the perfect solution to this problem. Today’s pet owners, breeders and veterinary clinics use specially designed cleaning wipes or materials meant specifically to clean your dog’s ears well, and are completely safe (unlike water, which should never be used inside a dog’s ear canal). Most cleaners resemble a simple liquid solution. Be sure to always read the instructions provided before using your cleaner! ● Never use cue tips to clean a dog’s ears! It’s recommended to clean your dog’s ears on a regular basis. Bacteria or dirt can lead to an outer ear infection, which is a nuisance, often uncomfortable, but treatable. If you leave your dog’s outer ear infection untreated, however, it can lead to middle then inner ear, which is much, much more dire and can result in severe, permanent damage to your dog’s health on top of permanent hearing loss. If you think your dog has an inner ear infection, consult your veterinarian immediately! Countless dog ear cleaning products exist in the market today, many seeming just as good as the rest. So how are you ever going to tell the difference? Ask yourself what exactly you’re looking for, and what you want your dog ear cleaner to do. Is it just a routine cleaning your after, or do you want to treat bacteria or some type of infection? Do you just want to get rid of any possible dirt, or are you trying to take care of a specific odor? Is it important to you that your cleaner be all natural? ● It’s important to search for a product containing no antibiotics, steroids, alcohol, or toxic materials of any kind. A 100% all natural, cortizone free dog ear cleaning solution, NaturPet Ear Drops is both an antibacterial and antiviral herb blend, offering several natural pain relieving and anti-inflammatory herbs. Successfully removing dirt, wax, debris, dust, & bacteria from your pets ears, This NaturPet ear wash not only successfully washes your dog’s ears, but helps stop swimmers ear to boot! 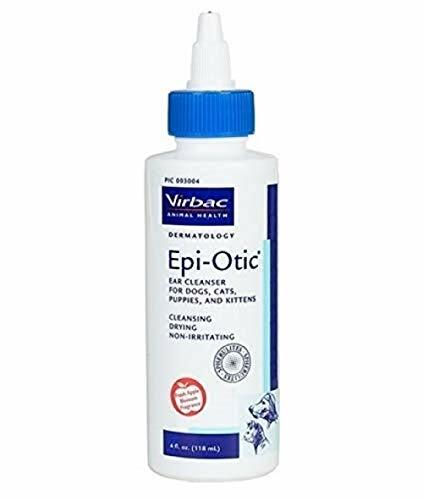 Specifically designed to treat external ear inflammation due to bacterial, viral, or yeast infections, Pet King Brand Zymox Otic Pet Ear Treatment successfully destroys antibiotic resistant organisms without containing any antibiotics in the formula. 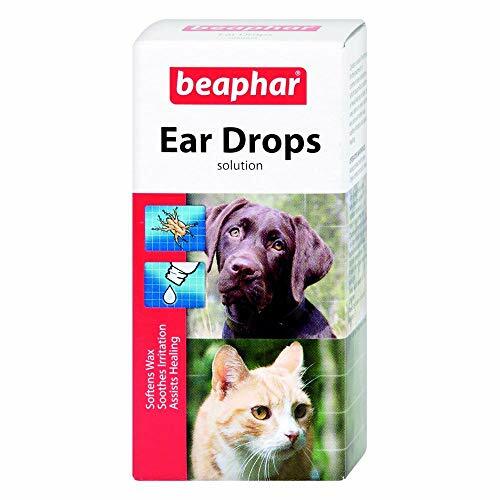 Offered in a 1.25 ounce bottle, these ear cleaning drops couldn’t be easier to use! A 1.25 ounce bottle is much smaller than the others here. 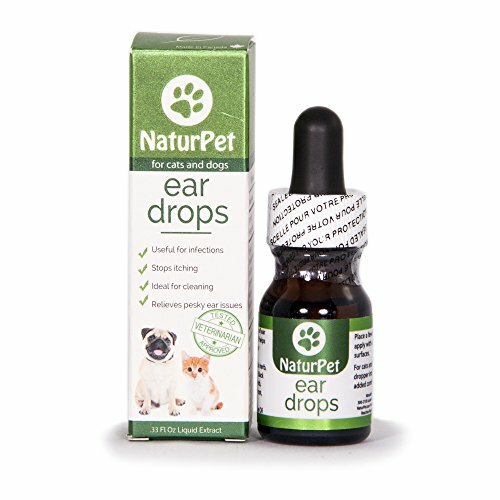 Available for use with both cats and dogs, these ear cleaning drops are specially formulated to help treat a variety of ear conditions, including wax buildup, ear mites, and more! Including natural pyrethrum, the easy to use drop dispenser helps soothe ear irritation and promotes overall healing. As a multi-system dog ear treatment, EcoEars claims itch, gunk and smell will be gone within 2-3 days, and helps restore ears to full health in 7-10 days! EcoEars attacks the problem areas fast, leaving ears fresh and clean. 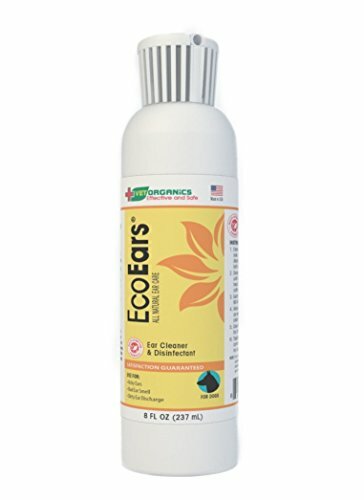 On top of this, EcoEars is an all-natural dog ear treatment, fantastic for sensitive ears! To top it all of, EcoEars offers a 100% money back guarantee. Utilizing an advanced veterinary formula designed by Gently Clean, Pet MD’s formula both deodorizes and dries your pet’s ears. It works to prevent ear infections, remove wax buildup, and get rid of unwanted debris. On top of all this, the wipes are 100% alcohol free, non-irritating, and completely disposable! 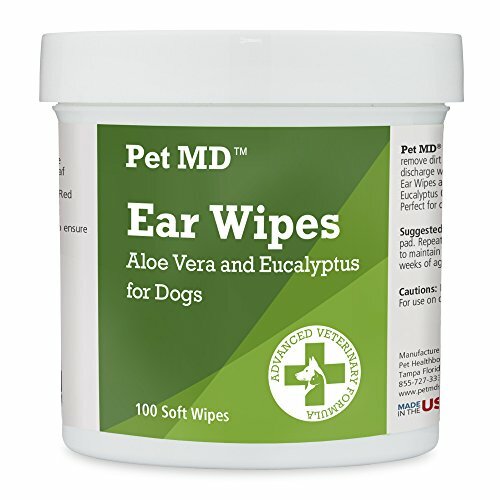 Pet MD’s dog ear cleaning wipes is recommended for dogs over 12 weeks (3 months) old. 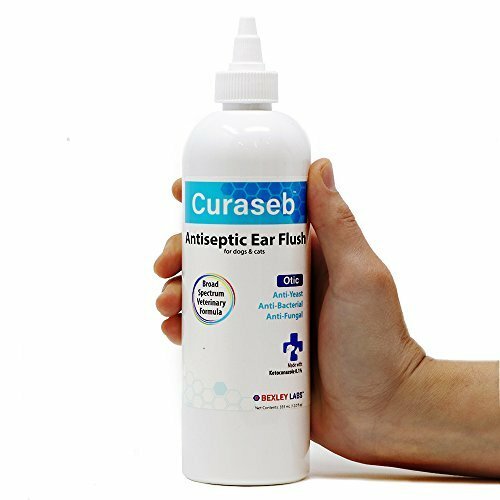 Specially vet formulated to treat bacteria, yeast and fungus, Curaseb flush contains prescription grade Ketoconazole (Antifungal & Anti-Yeast) & Tris-EDTA (Antibacterial) to fight even the worst of ear infections! Not only is Curaseb an ear cleaning treatment, it can be used as a topical cream on the skin too! Curaseb can even be used to treat rashes, scaly patches and acne! Curaseb offers a free money back guarantee if you aren’t satisfied with their product, so there is absolutely no risk. Virabac’s patented anti-odor technology inhibits bacterial growth, helping keep your dog’s ears clean and fresh smelling. This ear cleaner specifically targets bacterial and yeast infections to keep your dog safe and clean! The neutral ph formula is safe to use, never too acidic or basic, and is guaranteed not to irritate your dogs delicate skin. 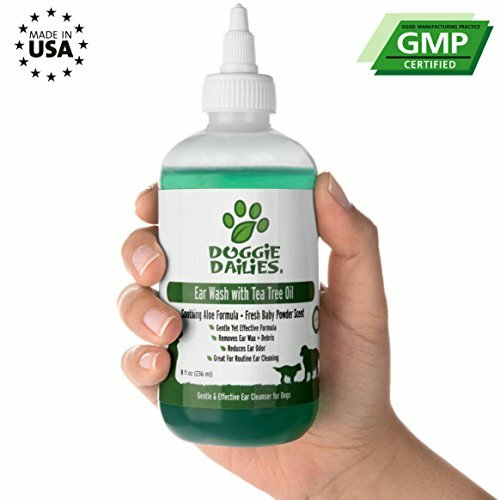 Available in the form of veterinary formulated ear drops, Doggie Dailies an effective blend of Aloe Vera, Tea Tree Oil, Witch Hazel, and Echinacea that works great on both dogs and cats to remove dirt, ear wax, and other debris from your pet’s ears! It’s guaranteed to have a pleasant scent while either burning or stinging your dog’s ears. Each bottle contains an easy to use applicator tip, and offers a 100% money back satisfaction guarantee! Free, exclusive ebook offered with purchase! Free ebook offered isn’t about cleaning a dog’s ears, but common threats to a dog’s health. How do you clean dog ears? Though cleaning a dog’s ears is a pretty simple process, it’s easy to make a mistake and make matters worse. That being said, make sure you’re doing it correctly! Step 1: Check the outer ear for dirt, gently wiping or brushing it away with a specialized ear cleaner on a cotton ball or square. Make sure to be very careful not to apply too much pressure! Step 2: Next, flip the ear back and peer inside the ear canal. Make sure there is no bad odor or visable discharge, which could be signs of an infection. Making sure your closely following the directions provided by your chosen ear cleaner product, insert a small amount into the ear. Gently began rubbing your dog’s outer ears in order to move the solution. Whatever you do, don’t pour water into your dog’s ear canal! Unlike humans, the ear canal of a dog forms an ‘L’, and any fluid poured into it can easily pool at the bottom. If this happens, you can actually make matters much worse; water/fluid buildup can lead to an ear infection. ● Make sure this whole process is positive for your dog! Always use a happy, easy going tone of voice, and never become upset. You don’t want your dog to begin to fear the process and start fighting you. How do you clean puppy ears? Cleaning puppy ears is very similar to adult dog ears, with an exception for very small puppies. It often isn’t recommended to try to clean a puppy’s ears under 2-3 months old,and most cleaning solutions will recommend against use for dogs so young. If you want to have your small puppy’s ears cleaned, it’s best to consult your veterinarian. Young puppies are often very delicate, haven’t fully developed, and are easily injured. For these reasons, it’s very important to use caution around your small puppy! There are many products out there today, but you want to make sure you find the right dog ear cleaner for the job. Be sure to know exactly what you’re trying to accomplish, and what benefits you want your ear cleaner to give your dog. Not all cleaners do the same thing, so vigilance is a must!